This is was an unexpected cake. We had just returned from a totally unplanned last minute 5 day trip to Los Angeles (which was amazing, by the way) and heading into the kitchen to bake was the last thing on my mind upon return. However, the in-laws wanted a Sunday afternoon visit and at the last minute I decided that I’d make a cake to go along with the afternoon coffee. Unfortunately, they cancelled, so that meant I had an entire bundt cake with no guests. My husband didn’t see a problem with this situation. Especially after he had a slice and then another and said it was the best cake he’d eaten in a long time. Well, it’s true. This is a very good cake. And it’s easy to whip up too. Which is great when you have Sunday afternoon visitors and maybe it’s even better when you don’t! Coffee cakes don’t usually contain coffee, they’re usually meant to be enjoyed along with a cup or two. 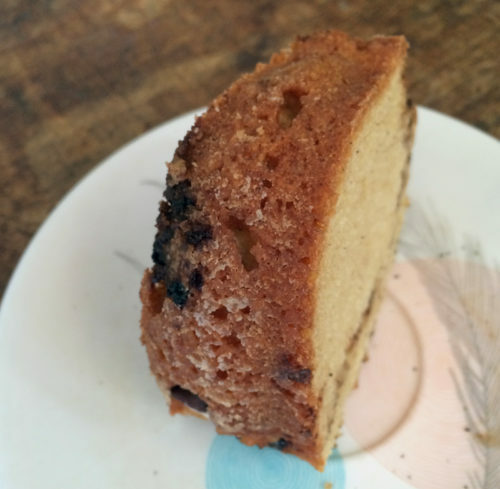 But this cake has got a nicely bitter bite from some instant Italian espresso powder sprinkled inside and on top of the cake. There’s also a good amount of cinnamon, sugar and some dark chocolate chips too. My husband loved what he called the bitter crunchy stuff (aka the espresso chocolate sprinkles) while I loved the buttery, nutmeg-y crumb of the cake itself. Maybe because of all the freshly grated nutmeg that went into the batter, it reminded me of an old fashioned plain donut, which is my favourite donut in the whole world. Boring, maybe, but there’s something about nutmeg that I’m completely smitten with. The texture, however, is completely un-donut like. It’s not dense but super light instead – it provides a nice contrast to the crunch of the topping and the golden exterior. 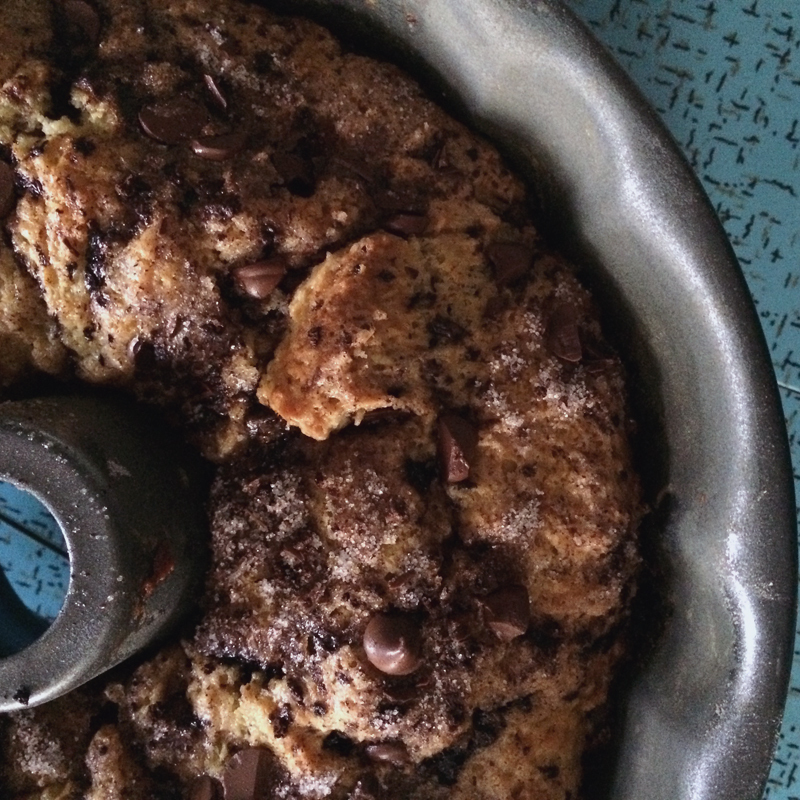 As we head into a new weekend, maybe you should give this coffee cake a try. It’s great with a late night cup of tea and maybe even better for breakfast with your morning coffee. If you’re in town, make sure you stop by Got Craft at the Maritime Labour Centre in East Van on Saturday and Sunday where I’ll be selling my cards, note pads, birthday calendars and prints. It’s my favourite local craft fair and I’d love to say hello and chat! But if you’re not a Vancouverite or can’t make it out, remember this cake. It’s a keeper. Oh crumbs, I forgot to mention it, but I’d love it if you could “like” my photo on the Le Cruset Canada facebook page. It’s highly unlikely I’ll win the contest, but it would be nice to dream of a new set of Le Cruset’s new stainless steel cookware! I used instant Italian espresso but I think some finely ground espresso beans would also work, though you’d lose that texture that a freezer-dried instant coffee can provide. In a medium sized bowl, whisk together the flour, nutmeg, cinnamon, baking soda, baking powder and salt. Set aside. In a large bowl, cream together the butter and sugar for 1 minute until fluffy. Add in the eggs one at a time, mixing well after each addition. Add in the yogurt and the vanilla until combined. Slowly stir in half of the flour mixture and when that is combined, add in the rest. Batter will be very thick. In a small bowl, combine the sugar, cinnamon, espresso and chopped chocolate chips together. Spoon half of the batter into the bundt pan and spread it out so that it lines the bottom of the pan. Sprinkle half of the espresso mixture over top the batter. Spoon on the remaining batter, spreading it out, and sprinkle the rest of the espresso mixture on top. Bake for 40-45 minutes or until a cake tester comes out clean and the top of the cake is nice and golden. 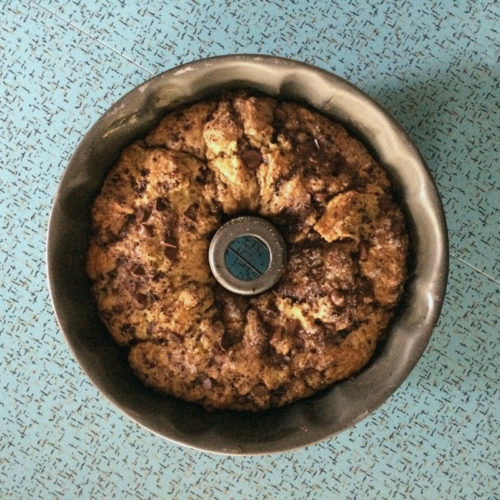 Cool in the pan for 20 minutes before removing cake to fully cool on a rack. 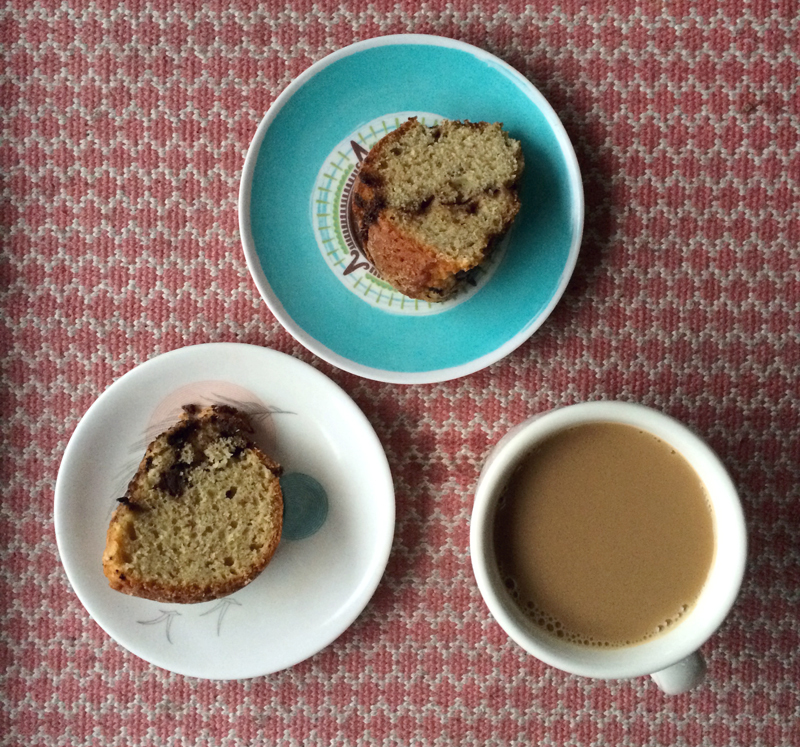 I love coffee in whatever form I can get it, and this bundt sounds absolutely lovely! I am a terrible baker, but without fail when I try one of your recipes it always works! Delicious – thanks! I have a hard time finding instant espresso powder BUT I just realized I have a whole bag of chocolate covered espresso beans that I could grind up. That would cover the espresso and the chocolate ingredients. If I try it I will report back! Aw Meghan, that makes me so happy! So glad you enjoyed the cake – it’s a keeper for sure! Jennifer, I find it in the Italian delis and shops in my neighbourhood – the joys of living in Little Italy! But you could most certainly grind up those chocolate beans – but make sure to grid ’em fine. Let me know how it turns out. I love anything with coffee – and this looks like such a perfect treat! I’ve got to try this – Thanks for sharing! This coffee cake sounds nice! And it looks like it has a nice moist crumb. Yum! Oh boy do I miss eating cake made with AP flour. Amber, I’m sure if you’re a coffee lover, you’ll be a fan! Thanks Joanne M 🙂 I should make more cakes with other flours to try them out! Brenna, I did use a 2% fat yogurt, I never really thought it would make a difference, but of course it would! Maybe you could check the cake doneness at the 30 minute mark and go from there? If you feel up to it, that would be awesome! Thanks! I just made this yesterday. 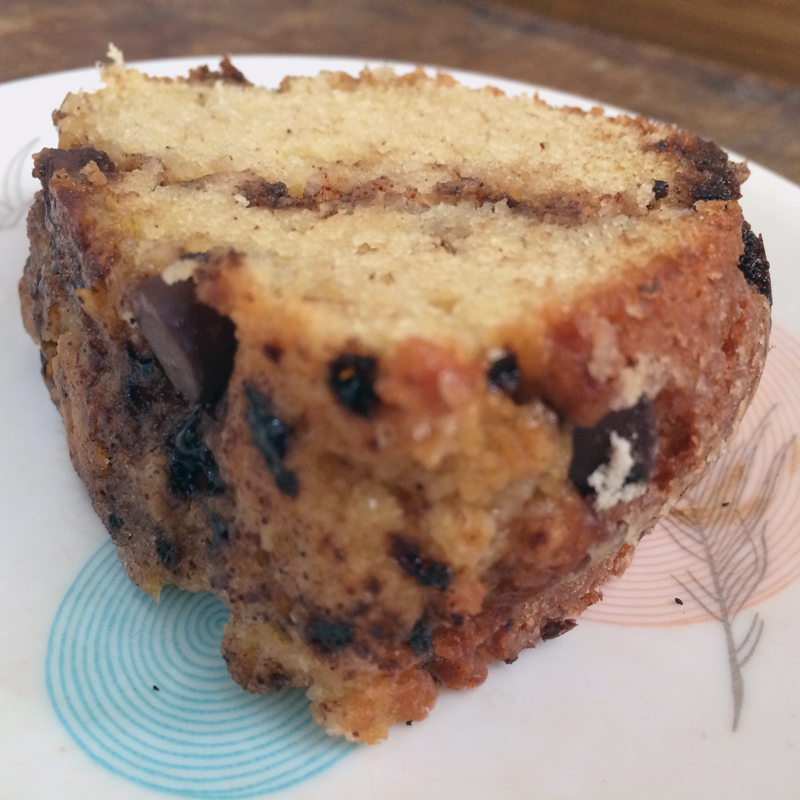 I was tempted to up the chocolate chips, but I restrained myself and it was delicious and chocolate-ly just the way it was! Jess, so glad you enjoyed it!